Now that the School tennis season is over, we need everyone on the team looking for chances to play. Rest time is over, look to start getting involved with tournaments. Coaches want Clear Brook to be the most represented school in all of these tournaments. The deadline has been extended for Clear Brook players. This is a great chance to get in a tournament and some fun for the parents. Food and Drinks will be served Friday evening as well as snacks and lunch on Saturday. Who can pass up free food? Sign up for the CCEF Tennis Tournament here. The next chance to improve your USTA ranking is coming up soon. Sign up for the May King Daddy Challenger and try to qualify for Champs. I want to see everyone on the team get that Champ qualification! Let’s fill up the team with Champs and Super Champs. You can sign up for the Challenger here. The deadline to sign up is coming up this Thursday at Midnight! If you champ up, let it be known! We want to highlight all your accomplishments and will be happy to post on the website, twitter, and instagram! You can always look for tournaments on TennisLink. I want to see Clear Brook represented in every tournament out there, so get your teammates and friends to go travel with you! Remember, if you can improve your UTR high enough before tryouts you can skip JV tryouts! If you need any help, just ask a Coach for help. We want to see you improve and every time you do, you help the program. So get out there and play! Congratulations go out to Maria and Jackson for a great season in Mixed Doubles. Since Spring Break, they have won the Kemah Tournament, District and placed 3rd at Regionals! Rest up, and get ready to get back out to the grind. The Freshmen Wolverines dominated at district today bringing home first place team trophies for boys and girls. Lily Wilson and Jennifer Merrill teamed for 1st place in girls doubles followed by Allie Cao and Sarah Hammond placed 3rd in Girls doubles. Julianna Padilla son 3rd in girls singles over team mate Samantha Lalich who placed 4th. 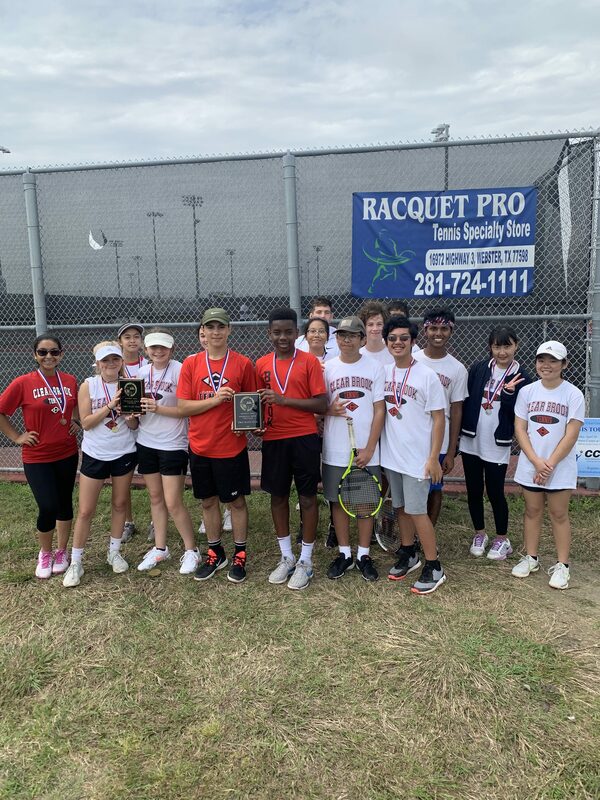 Deji Adewuya and Blake Sharp claimed 1st place doubles doubles while Scott Scroggins and William Ho placed 3rd. Carlo Vaccaro and Tammy Truong won 1st place Mixed Doubles over team mates Kyle Nguyen and Riko Kobayashi in the final. The car wash scheduled for April 13 has been cancelled because of the forecasted weather. The Summer Camp page is now active for this coming 2019 summer. We will be hosting 3 sessions this summer: one in June, one in July, and one right before Try-outs. Head on over to the Summer Camp page to sign up. The district tournament has wrapped and Clear Brook has a champion. Jackson and Maria came away with 1st place in Mixed Doubles. Tony and Kevin placed 3rd in boys doubles, and Maia and Arildayl placed 4th in girls doubles. It was a great tournament and Clear Brook had more advance deeper in the tournament than ever before. This year, we will be trying to get UTR rankings by recording the district matches in the UTR system. You can see the draws here. There are still some high school players that are not in the system, so they do not appear on the draws. If you are supposed to be in the draw but don’t see your name, you may register up until Thursday morning at the link above. See you coach for the password. I know some of you love to use Social media so I thought this might be a great chance to put that power to use. The UTR is looking for a few Texas High School tennis players to become Ambassadors by posting content about tennis. Go to the link here to sign-up and see if you qualify. Today’s practice has been cancelled because of weather. The JV tournament is still on for tomorrow at this moment.